While nothing new this weekend will challenge the figures put up by Cloverfield last frame, this unusually strong January at the box office should keep going with a deeper slate of films. After causing heads to shake around the world by making a sixth Rocky film, and getting even more heads moving by it actually being not that bad, Sylvester Stallone is trying again for some career nostalgia. Rambo is the fourth movie in the... uh... Rambo series, coming 20 years after he singlehandedly defeated communism in Afghanistan. Yeah, thanks a lot for that, by the way. 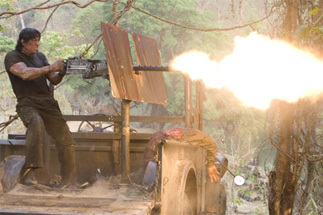 Now, an aging John Rambo lives like a warrior monk in the hills of northern Thailand, hoping to be left alone to live out the rest of his life with the memories of all the stuff he did and people he killed to keep him going. He is, however, really close to the border of Burma, which, if you've been following the news at all in the last little while, is one of the most repressive regimes in the world that isn't North Korea. When some missionary/activists come up his way hoping to sneak into the country to try and help out resistance fighters in that country, then promptly get captured – well, Rambo gets that old righteous killing feeling again, and a bunch of people are gonna die. Although the idea of the 62-year-old Stallone taking on the entire Burmese army might seem a little silly, it's not that much sillier than the second or third movies (leaving First Blood alone, since it was almost realistic in comparison). And although straight-up gun-fueled action has mostly gone out of style, giving way to martial arts battles, with the right concept, gun battles could come back as a bit of a "novelty".